In evening hours on Friday, September 14, 2012, Czech Ministry of Health issued domestic ban on sale of all liquor that contained more than 20 volume per cent alcohol. Export bans on liquor to Slovakia and Poland followed on Tuesday; and on Thursday, September 21, Czech Ministry of Health issued a ban on all exports under the pressure from EU. Liquor tainted with industrial alcohol with high methanol content so far killed 23 people and sickened many more so the total death toll will likely be even higher. Whilst in the beginning it seemed that the main source of tainted alcohol would be identified among backstreet producers and illegal resellers, it soon became clear that this is not case because some of the victims of tainted liquor poisoning purchased goods labeled with excise stamps in well-established shops and restaurants. This ban on sales and exports will be very expensive for all producers of liquor, both compliant and non-compliant alike. The fact that liquor with genuine-looking excise stamps caused fatal poisoning in consumers who had all reasons to believe that the concerned product passed quality control is a tragic symptom of system failure. According to official estimates, liquor equipped with forged excise stamps has about 15-20% market share. This situation has occurred for years. Failures with large financial impact occur in all industries, as obvious from Three Mile Island (1979), Bhopal methylisothiocyanate leak (1984), Chernobyl (1986), David-Besse facility (2002), shuttle Columbia and major blackouts in north-western USA (2003), the collapse of Lehman Brothers (2008), Macondo well blowout in Mexican Gulf (2010), and the Fukushima nuclear plant disaster (2010). Some of these accidents eventually led to implementation of sophisticated early warning signal systems designed to identify accident precursors in order to introduce corrective and preventative action plans before occurrence of a major accident. Safety culture, risk awareness, and effective organizational safety practices found in high reliability organizations are closely related. Effective organizational practices, such as encouraging that incidents be reported and allocating adequate resources for safe operation are required to make safety systems work successfully are essential in prevention of major incidents[i]. This cannot happen when diversion of part of produce to the black market is integral part of corporate operations and vital part of income, a business strategy of which the authorities are either unaware or ignorant. Production of alcohol which is safe to drink is no different. It should be possible to withdraw a product with a quality problem from the market without devastating impact on all other produce, and without affecting all other brands of the same producer and the industry as a whole. A brand product equipped with an excision stamp should also be distinguishable from fakes. The Czechs had to ban sale of all products from all manufacturers regardless their internal QC/QA system. This fact indicates that big brand producers either cannot guarantee QC/QA in the end of their own production line, which I find most unlikely, or do not have their own distribution chain under control and therefore cannot distinguish their own brand with genuine excision stamps from fakes. This ban is indicative of a system failure in QC/QA. State-imposed ban on sale of liquor which contains more than 20% alcohol is certainly an inconvenience, especially in a country with one of the highest consumption of alcohol per capita, but it is not a matter of life and death. Let’s take the incident a little bit further and think about the same problem with the same consequences occurring in a different industry: pharmaceuticals. As per Homeland Security Presidential Directive 21 [ii] on Public health and medical preparedness, from 2007, one of the critical components of public health and medical preparedness is distribution of countermeasures. According to industry estimates, the total number of fake pharmaceutical brands on the market is about 20%. If analogical situation occurs in this industry, the potential impact would apart from shortage of certain products also be considerable public panic. Rasmussen model (figure 1) can be applied to any safety or QC/QA system, including system of control of critical points in food production and including pharmaceuticals. Factors like increased workload, lack of investment in training, and high staff turnover push behavior of workers outside boundaries of unconditionally safe behavior, and ultimately toward loss of control over the processes. Accident then can manifest as a catastrophic event (e.g. explosion and fire in the case of Texas City Refinery), leak of sensitive data[iii] or inability to distinguish genuine product from fake is in the case of Czech liquor producers. [iv] Impact on organizations then comes not only through direct loss of product which should have been on the market, but also through risk of litigation and loss of trust, and eventually stock value. 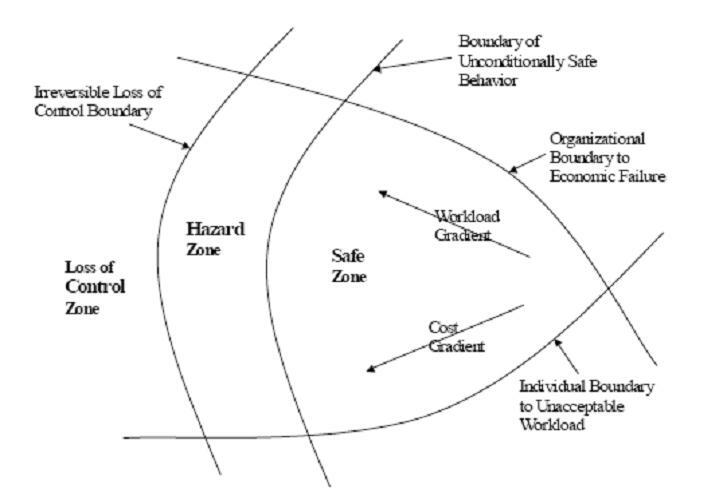 FIG 1: Rasmussen’s Model Showing Three Zones of Risks (Howell et al. 2002): The graph originally comes from the construction industry and demonstrates safety zones for organizational operations (Alavi, 2010)[v]. As per the rule of logic, catastrophic failure eventually happens providing any of the risk factors is present, and the probability of systemic failure is dependent on number of variables (risk factors) and length of time. It is not in the interest of compliant producers to tolerate those who violate industry standards because costs of QC/QA system failure can potentially have large impact on all of them regardless their behavior. From this perspective, catastrophic failure in situation of insufficient risk management and quality control is not a freak event but tautology. [v] Alavi H: Development of an accident model for construction industry. The University of Texas at Arlington, 2010.